On June 2018, due to the trade war between China and US, 25% more tariff was added on from original 15% on imported vehicles. The policy was effective starting from July and we saw the negative impact on Tesla in 3Q18. 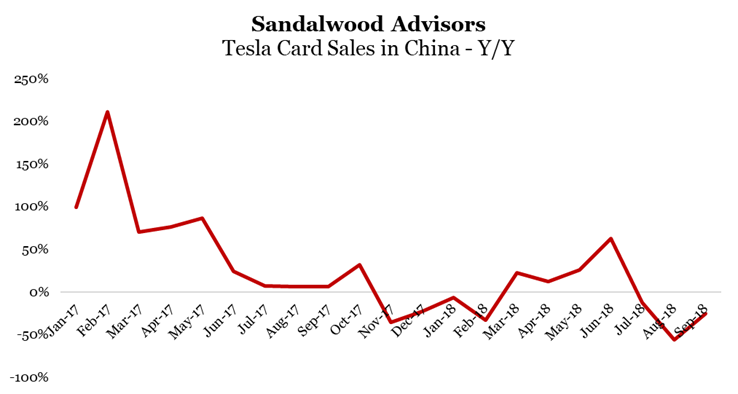 As shown in the chart below, Tesla card sales in mainland China suggests a declining trend after a spike in Jun when there’s a temporary tariff decrease. China was around 15% of Tesla’s global revenue and was always one of the key growth potential investors are looking at. Note: card sales tracked people’s spending at the car dealers. We eliminated card transactions below 20K RMB to proxy car sales and filter out the car maintenance and other services at the dealers. The overall China Automobile Industry faces challenges as well as recent Sep published data fell for a third straight month (Source: WSJ). Part of the drag was due to a high base in 2017 when there was tax reduction and now the benefit was gone, so that purchases was consumed in advance and 2018 faces both price increase as well as tough comps. Despite that, we still saw electric vehicle growth remained strong and positively helped companies like BYD. 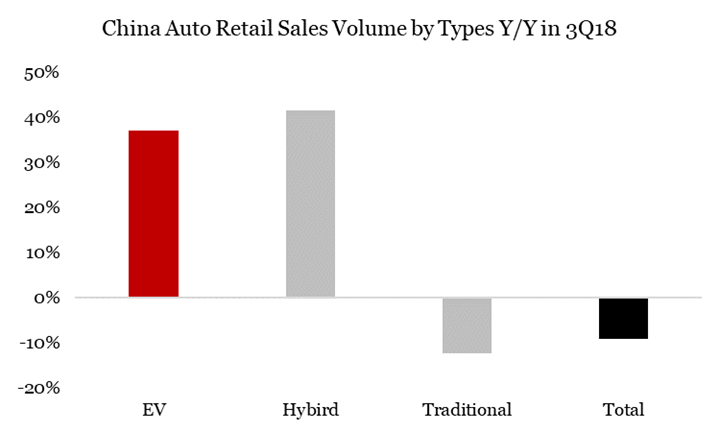 For more data about Tesla or the China Auto market trend, please contact us here. How is Korea OLED industry affected by iPhone X?